"It looks weak, but it's anything but harmless." 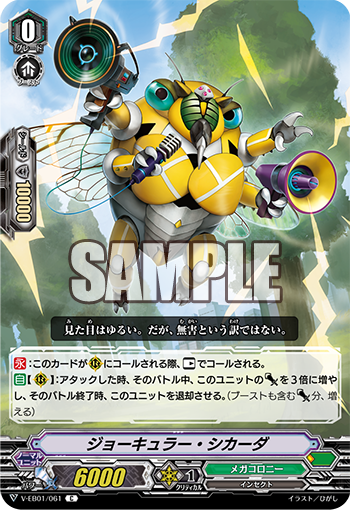 The Japanese Card of the Day for June 7th, 2018, is a grade 0 Megacolony Common from V-Extra Booster 01: The Destructive Roar, Jocular Cicada. Cicada is Megacolony's variation on Giro, a grade 0 that isn't necessarily intended to be set as your First Vanguard but provides a reward for running more than the standard number of normal unit 0s. While Giro was defensive, Cicada is an obviously offensive unit that can quickly gain out-of-control levels of power thanks to its ability to triple itself; when boosted with Phantom Black the unit jumps up to a 60k card that can only be guarded with triggers, and every one of your own triggers effectively becomes a 30k when put on Cicada. With two triggers, he can climb as high as 120, and that's before Butterfly Officer boosts. The drawback to this on top of decreasing your deck's consistency with an extra 0 and taking a -1 from retiring him is that Cicada has what's functionally "summoning sickness" (to borrow from Magic); it can't attack on the same turn it's placed. ...but perhaps the most optimistic outcome would instead be Cicada foreshadowing a lesser implementation of similar card effects. Let's not forget that Giro lead us to Herculean Knight Allobrox, a grade 2 that under the right conditions shared Giro's property of being impossible to attack. Cicada has the same potential to be the template for a more easily used card to come, with less overall power but a similarly-strong game-closing skill. Cicada's set number is 061, putting him just after Butterfly Officer. As trigger units typically go after the normal unit grade 0s, the clan's Glyme clone is likely right after Cicada in the setlist--potentially Machining Worker Ant, or Madame Mirage. The previous Japanese Card of the Day was Savage Raider.